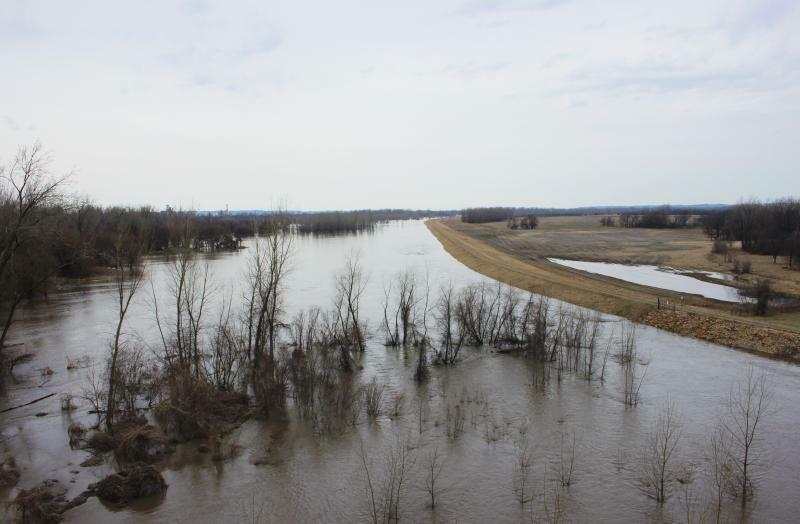 Missouri River breaches levees near Winthrop, residents urged to leave – Welcome to Wyandotte Daily! The executive order activates the state’s Emergency Operations Plan, which lets state agencies coordinate efforts directly with cities and counties. Buchanan County Commissioner Ron Hook says water is coming through the levee and over the top, flooding farmland. He’s part of the team telling people to get out. “We had sheriff’s department, emergency managers, going door to door, knocking, making sure people were aware water was going to be on their doorstep real soon,” Hook said. Amanda Horton lives in Winthrop, Missouri, about half a mile from the Missouri River. “It looks like I have a lake very close to my house, which is not normal,” Horton said. Horton said she was driving back and forth to Atchison, Kansas, Thursday morning over U.S. Highway 59. After the levee breach, she said the change was almost immediate. “There was water in the fields, everywhere. It’s pretty significant,” Horton said. The highway was closed shortly after the breach. With U.S. 59 shutdown, Horton’s three children had to stay home from school which is about eight miles away in Rushville, Missouri. There are only a few businesses in Winthrop. Horton said the liquor store owners left last weekend, and the convenience stores have sandbagged the lower part of their buildings and are packing up today. “A lot of our neighbors have already gotten their water shut off, so they’ve moved a lot of stuff out fearing water will get in and destroy their things,” she said. Horton said usually when the river rises, the water flows into Sugar Lake at the Lewis and Clark State Park southeast of Winthrop. She said residents there have basements and houses filled with water. Jim Kunce is the superintendent of Lewis and Clark State Park in Buchanan County, Missouri. He said the park was prepared for the flood. All staff and equipment were evacuated. “The park has been through different floods throughout its existence. Each time it floods, something does change, whether we lose some trees, or we have to make adjustments to our landscaping,” he said. He said he expects to see the impacts of Thursday’s levee breach within the next 24 hours. Compared to a flood in 1993 and one in 2011, this would be the worst, as far as the water level is concerned. 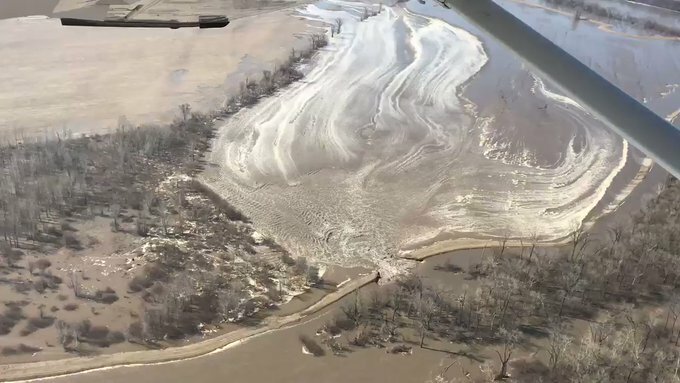 Severe flooding along the Missouri River after last week’s “bomb cyclone” and ongoing snowmelt has affected communities in Nebraska, Iowa, Kansas and Missouri. Kansas Gov. Laura Kelly has issued an executive order temporarily waiving fees and easing regulation on motor carriers assisting with flood relief, to expedite restoration efforts. “It’s important communities in both states receive the aid they need immediately,” Kelly said in a statement. Kelly is expected to tour affected areas today (Thursday) with the National Guard and Kansas Department of Emergency Management. The National Weather Service says the Missouri River at Atchison is in major flood stage and expected to crest at 31.8 feet around 1 p.m. Friday. The record for that area is 31.6 feet.